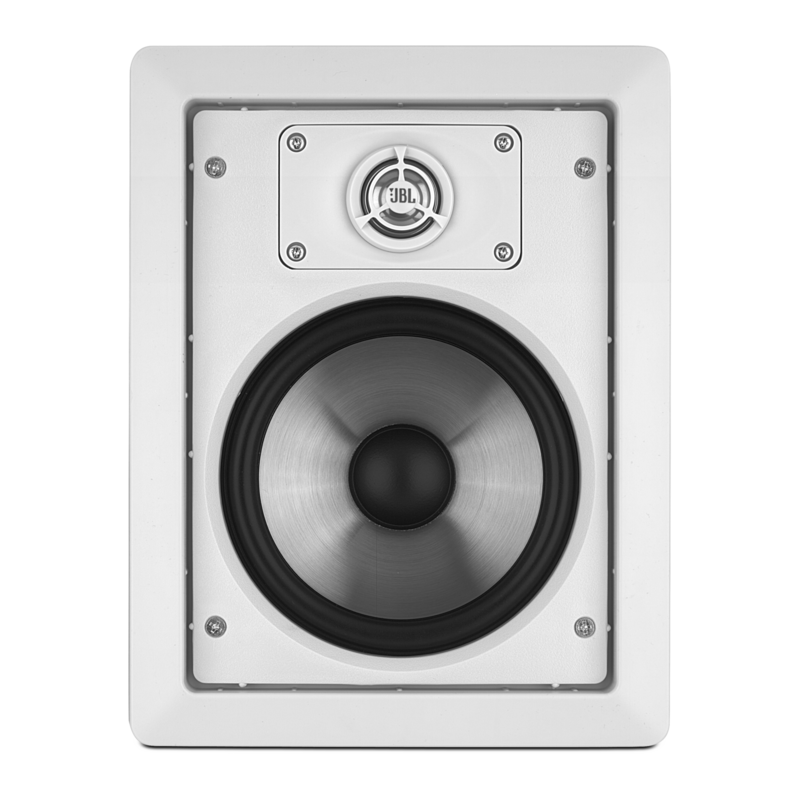 JBL engineers designed the SP6II in-wall loudspeaker to produce accurate, enveloping sound from an AVR (audio/video receiver) or amplifier capable of delivering up to 80 watts of power. Realistic reproduction of music requires clean, undistorted low frequencies. JBL SP6II in-wall loudspeakers feature a 6-1/2-inch (165-millimeter) titanium-laminate cone that offers great stiffness for low distortion. Rubber surrounds ensure durability, while extended polepieces produce deep, powerful bass with little distortion. The result is enveloping, satisfying audio reproduction from the bottom up. The SP6II’s thin but rigid 1-inch (25-millimeter) titanium-laminate tweeter delivers accurate, clear high-frequency response, even at elevated volume levels. The tweeter’s swivel-mount means that you can direct high frequencies exactly where you want them. Forget about “sweet spots.” With proprietary JBL Elliptical Oblate Spheroidal (EOS) waveguide technology, your whole room becomes a perfect listening position. Originally designed for JBL Professional LSR studio monitors, the SP6II in-wall loudspeaker’s EOS waveguide distributes sound evenly throughout your playback area. With a mounting depth of just 3-7/8 inches (98 millimeters) and a weight of only 5 pounds (2.3 kilograms), the lightweight, space-saving JBL SP6II loudspeakers offer maximum installation flexibility. A cutting template and integrated dog-ear brackets accommodate retrofit applications, while rough-in frames are available for new construction. The SP6II in-wall loudspeakers offer outstanding performance, but that doesn’t mean that they have to stand out in a room. You can paint the frames and grilles so that the loudspeakers match your wall décor. You’ll hardly notice your SP6IIs – until you turn them on. A pair of JBL® SP6II in-wall loudspeakers offers any home true JBL-quality sound without taking up valuable floor or shelf space. Movies sound more enveloping within your home theater, and your favorite music comes alive throughout the house. The SP6II’s 6-1/2-inch (165-millimeter) titanium-laminate low-frequency woofer delivers exceptional bass, while a swivel-mounted, titanium-laminate tweeter produces accurate, clear high-frequency output. Proprietary Elliptical Oblate Spheroidal™ (EOS) waveguide technology and 80 watts of peak power handling ensure that the SP6II in-wall loudspeakers distribute sound evenly and smoothly throughout your listening area. The SP6II’s shallow mounting depth increases your installation options. And the SP6II’s paintable frame and grille let the in-wall loudspeakers blend into any room décor. SP6II wurde bewertet mit 4.9 von 5 von 8. Rated 5 von 5 von Chaphole aus Buy these on Black Friday or you'll hate yourself I purchased two sets of these a while back when they were on sale for $69.99 a pair. At this price for this quality, anyone who is looking to go inwall, will be stoked with the results. Amazing sound, clean looking, paintable grills, positional tweeters and very easy to install. Comes with templates to mark your walls so you don't make the hole too big. One note, if your interior wall studs are 2x3 construction, unless the wall is open on the back side, you will run into clearance problems. You could always frame the front side with a custom trim ring if necessary to make fit, these are meant for the depth of a 2x4 wall construction. They come as a set. Rated 5 von 5 von Beatlefan64 aus You can't beat JBL. I installed a pair of JBL AS6's when I remodeled my kitchen in 97. They sound fantastic. My son-in-law will soon be starting a renovation project in his home and I am giving him these as he is a musician and a die-hard music fan. I know he will not be disappointed in the sound. For the record I own a pair of classic L300's as well as Pro lll, P40 and LSR32. Enough said!!!! Rated 5 von 5 von ThePokrocks96 aus Easy install and great sound Purchased 2 pairs of these for music and tv for my business and couldn't be happier. They were delivered quickly and packaged very good. The drivers in these are top notch, nice tweeter that pivots and a stiff woofer. Bass really improves after they break in, which took about three weeks of playing music. Sound is great, sharp highs with much detail and balanced with accurate bass. I would say the biggest strength is they voice amazingly well. Sometimes you think there's someone in the room that's talking. Installing them was a breeze. The installation system work perfectly. I did notice the second pair installed into a wall without much insulation in it, sounds weaker in the bass department. So I'll have to get some insulation and put more behind the speakers. I would recommend to have some batted insulation on hand when installing. Rated 5 von 5 von Rikki Tikki Tavi aus Example: Great features! I installed these a couple weeks ago and I am very happy. The size is perfect (not so big that my wife doesn't like them and not so small that they have no bottom end). I am very happy. Rated 5 von 5 von Romuald aus Very good in-wall speaker, great value Speaker quality is very good, installation is easy and quick. The frame can be painted for a better integration and the sound is very good. I use them as surround speakers. Rated 5 von 5 von boblu aus great for music lovers Bought before Christmas, this is truely best speakers we have. Sound is very clear and beautiful. Can I use this pair as rear surround speakers mounted on wood frame above me, instead of in cell speakers facing me? What JBL center channel should I pair with these? Just bought 2 pairs for my front/rear surrounds. Hello! A good center channel is the Arena 125C or the Studio 520C. These two center channels will be a perfect fit for your current system. Can I use these speakers with the harman kardon AVR 171? Yes, you can use the SP6II with the AVR 171 receiver. Looks like Studio 235c and Studio 225c center speakers are discontinued. What are the other center speaker options that go well with these ones. I am looking for 5.1 surround. I recently purchased your SUB100PWH and these inwalls for surround. We still have the Studio 520c which you can use with these speakers. Otherwise, you can check our Stage center speakers which would also be a good match for these. What would be a good center speaker to compliment these? Yes, you can definitely use the JBL SP6II as in-ceiling speakers.